Women account for more than 50% of the U.S. Labor force and 60% of college graduates in both the U.S. and Europe. Yet, women hold only 5.0% of CEO positions at S&P 500 companies. Women encounter many barriers to success which limits career advancement. These barriers include unconscious biases, structural obstacles, self-limiting mindsets, work-life balance priorities, and emotional intelligence and gender differences - which lead men and women to approach virtually every aspect of business differently. It’s essential to understand the issues that keep women from advancing as part of your talent management program. 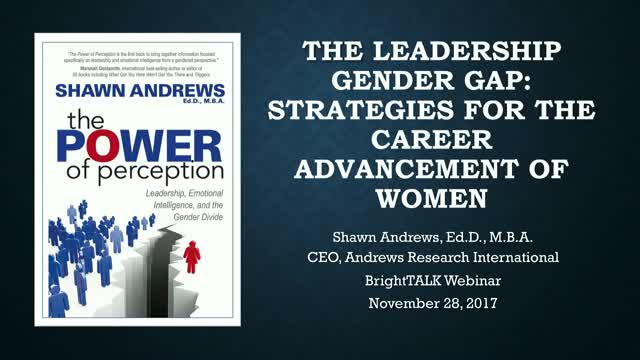 Dr. Shawn Andrews will provide strategies to help minimize these barriers and advance your career.